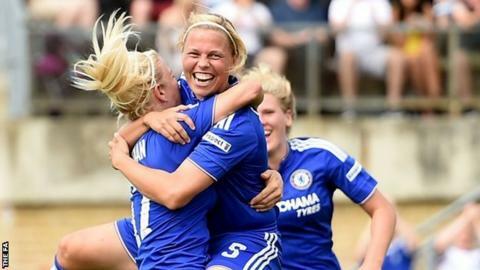 Chelsea Ladies defender Gilly Flaherty says everyone in the squad now has a champion's mentality, having lifted their first trophy, the Women's FA Cup. With just four matches remaining in the Women's Super League season, Flaherty, 24, believes that experience of winning can help Chelsea in the title race. "Before that final, only a few of us were champions, winning previously in some way," she told BBC London 94.9. "But now every single person at our club is a champion." Chelsea, who face rivals Arsenal on Sunday evening in a crucial league match, currently sit top of WSL 1. "Everyone here is a winner," Flaherty continued. "There's a new breed of confidence among the players and it's made them hungry for more. "You can't beat that feeling of winning with your mates. We want to experience it more. We don't just want to be a one-off club who win once - we want to win plenty more trophies." Chelsea are competing for four trophies this season and will make their debut in the Women's Champions League in October. Thursday's draw for the round of 32 pitted them against Scottish league champions Glasgow City. "I think it's a great tie for us," Flaherty added. "We played Glasgow in pre-season this year so we know a little bit about them. "We were looking out for the big teams, i.e. Lyon, PSG, Wolfsburg. We managed to miss the big ones in there and got a very exciting draw. "Glasgow are a great team, they've got a great set-up so we know it's not going to be easy against them."